“I tell you very openly: we cannot expect the economic downturn to be over quickly.” German Chancellor Angela Merkel made this statement in her New Year speech one year ago and the quote also launched our Focus topic on changing values(Link). One year on, the German Chancellor takes a far more positive view: “We have managed to emerge from the crisis stronger than before.” Germany has been able to recover from the year of bank failures and rescue packages with remarkable speed. And as a result there has been a shift in Germans’ priorities when it comes to values. At present, fewer Germans than before the crisis regard the retreat into the home as a rising trend. However, there is now more focus on achievement-related ideals. The topic of security clearly remains as important as before. 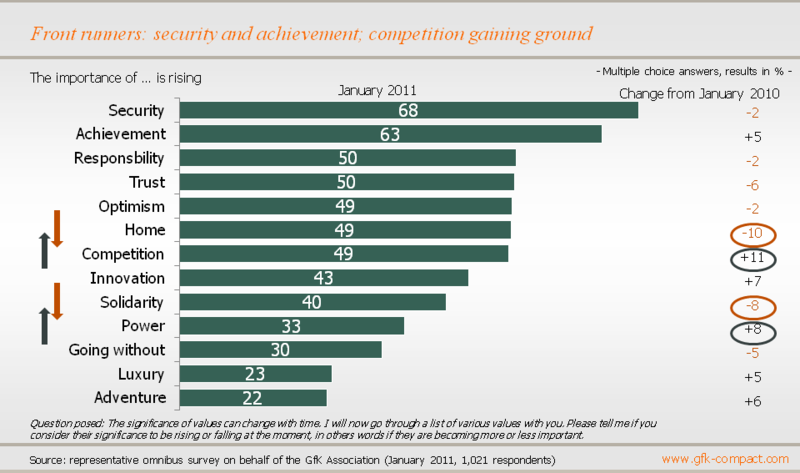 As in January 2010, the value of security has once again been placed in the number one spot. 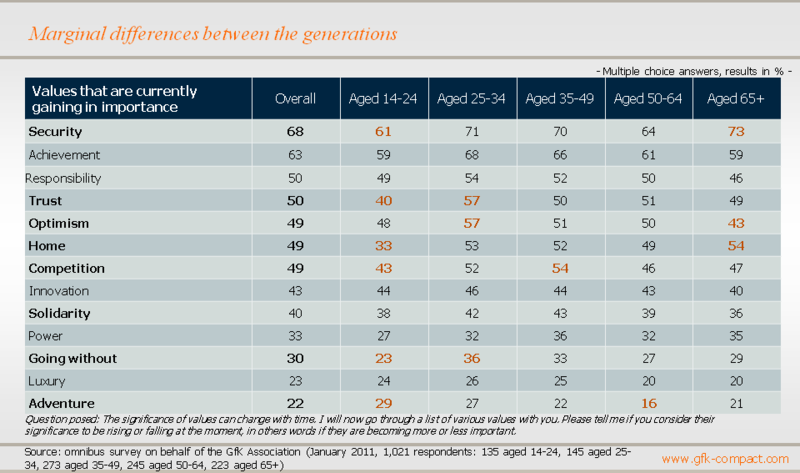 These findings are taken from the GfK Association’s latest survey on “Changing value perception”, which was conducted for the third time in January 2011. In the survey, over 1,000 respondents were asked to rate how they think the importance of particular values will develop in Germany. Almost 70% of respondents are certain that it will become increasingly important to live with a sense of security, while only 2% believe this importance could decrease. It is therefore apparent that Germans do not yet entirely trust that positive economic figures, brighter employment statistics and rescued companies will guarantee stability. Perhaps conditions outside of Germany’s borders are responsible for this skepticism. Greece is heavily in debt, the Irish economy is hanging in the balance, and other countries are considered to be at risk of economic collapse. News broadcasts on the domestic front are not entirely positive either: carcinogenic dioxins in chicken eggs, November’s terrorist attack warnings from Federal Minister of the Interior Thomas de Maizière and rising healthcare costs are just a few causes of anxiety and are ensuring that the issue of security remains in the top spot. However, many Germans also seem to take the approach that “nothing comes from nothing” and specifically ascribe increasing importance to the value of achievement for the future. Almost two in three respondents believe that it will become even more important to go the extra mile in future, placing achievement in second place, which is 5% more than just one year ago. It appears that Germans plan to pave the way now so that the upswing, which is still at an early stage, continues to gain momentum. 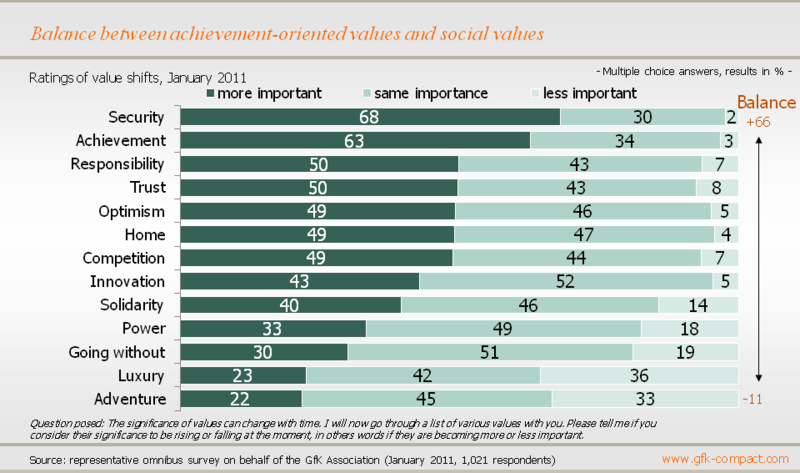 With social values on the one hand and achievement-oriented values on the other, Germans seem to like a balance. The issues of responsibility, trust, home, optimism and competition are all in relatively similar positions in the current rankings, and approximately half of respondents believe that these values will be given greater priority in future. Today, almost 50% of Germans believe that Germany will in future need to assert itself more strongly in view of rising competition, which is a significant increase on last year’s figure. A higher number of respondents than at the beginning of 2010 also now think this will only be possible with greater innovation. In addition, the necessity to possess individual competitive ability relative to others could continue to increase in the eyes of respondents – the slight decline in solidarity is suggestive of such a shift towards personal success becoming more important. In connection with this, the desire for greater power is also more common than before. Today, one in three respondents are worried about increasing self-interest in society, compared with one in four a year ago. As in the previous year, the lowest rankings are again for the values of luxury and adventure, although these are exhibiting a rising trend. More than 20% of Germans think that it is time to treat themselves to something special or to seek fulfillment in entirely new ways. However, those planning an adventurous trip need to have the funds available already, because conditions are currently not favorable for saving. Fewer Germans now also believe that it is necessary to tighten their belts and go without in future. While 35% considered it increasingly important to practice restraint a year ago, this opinion is only held by 30% of respondents at present. Teenagers and young adults aged up to 24 consider going without to be one of the least important values for the future: only one in four respondents think it will become more important to practice restraint. This same age group selected adventure more often than average, with more than 30% looking forward to an adventurous future. In comparison, among those aged 50 and above this was only the case for around one in five respondents. However, anyone who thinks that younger people are only interested in fun and excitement is mistaken: hard graft rather than idleness appears to be the motto of an above average number of young adults aged between 25 and 34. The achievement principle seems to stand in high regard among this age group in particular, although on the whole the different generations have remarkably similar views about the importance of most values. For an article about the latest world economic outlook of the International Monetary Fund (IMF), the German newspaper “Die Welt” recently published the following headline: “Germany is the IMF’s economic role model”. Other media also praise Germany’s success in overcoming the crisis and the consumer climate index is currently at a high. Despite this, Germans continue to attach importance to security after the difficult economic period over the last year. This is not only an expectation that Germans have of the government; they also intend to contribute themselves – with drive and motivation, as well as a healthy dose of optimism.